LINCOLN — Russell Means, a charismatic and controversial activist who drew attention to injustices against American Indians in Nebraska and elsewhere, died early Monday at his home in Porcupine, S.D. Hours later, Winnebago activist Frank LaMere offered tobacco and prayers to mark the death of a man he called “a great American” and friend. On Thursday, August 30, Tillicum Wawa interviewed people from Deep Green Resistance who were locked down at White Clay in support of the Lakota People of Pine Ridge to attempt to stop the sale of alcohol to Indians from the reservation. We also interviewed a medic who was there and Autumn Two Bulls whose son, Wakiyan, was pepper sprayed as well as Wakiyan himself. 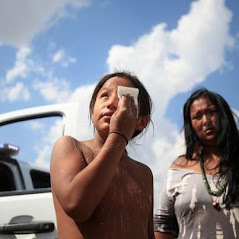 Raw footage: The macing of Lakota women and children by Sheridan County (Nebraska) Sheriff’s Deputy at Whiteclay Women’s Day of Peace on Sunday August 26, 2012. Video shot inside the horse trailer after the arrest of 5 protesters blocking the highway in Whiteclay on Sunday August 26, 2012. Exclusive video INSIDE THE HORSE TRAILER. On August 26, several organizations looking to have a peaceful march of women and children to protest alcohol sales in Whiteclay, Nebraska ended with protestors being carted away in horse trailers, verbal altercations and Native youth being maced. Autumn Two Bulls, a participant and Pine Ridge Reservation tribal legal liaison is the mother of 10-year-old Wakinyan (Lightning and Thunder.) who was one of the Native youth sprayed in the face with mace by a police officer. Modern technology is amazing. There is so much we can do with computers, smart phones, cameras and the Internet. Events can be shared with the world in almost an instant. When you go out in public you cannot really expect any kind of privacy anymore. There is always someone with either a camera equipped cell phone or camcorder to document everything you do. I love it. A protest in the Nebraska border town of Whiteclay ended Sunday after officers used a horse trailer to move five protesters to a nearby town. Olowan Martinez, a Lakota woman and protest organizer, said Monday the five had locked arms and stretched themselves across Nebraska 87 on the north end of Whiteclay. Sheridan County sheriff’s deputies, Oglala Sioux tribal officers and Nebraska State Patrol troopers in Whiteclay removed the group and put them in the horse trailer. She said she had never seen law enforcement react that way in Whiteclay. It’s still unclear what the five demonstrators arrested Sunday in Whiteclay were cited for. Sheridan County, Neb., attorney Jamie Simmons tells KOTA Territory News she can only speculate as to the possibilities until she gets all the paperwork from the Nebraska State Patrol and files official charges.